This photo illustration shows what Clean Line transmission projects would look like after construction. 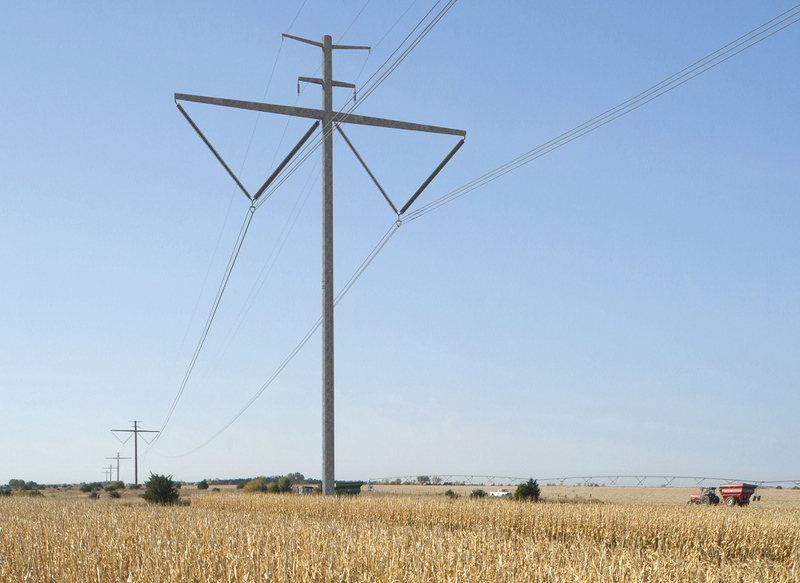 The sale of a planned long-distance transmission line project to a Chicago energy developer has left some customers more hopeful that it might someday deliver wind power from western Kansas to customers in the east. Clean Line Energy Partners announced Monday that it has agreed to sell all of its assets related to the 780-mile Grain Belt Express project to Invenergy, which builds, owns and operates energy projects in North America and Europe. The sale comes in advance of a series of public hearings in Missouri on the project, which has faced a series of legal and regulatory setbacks since it was proposed in 2011. It also leaves uncertainty about the status of the company that originally backed the project and spent much of the decade trying to advance it. A company official said it had no active projects remaining and was not pursuing any at this time. Earlier this year, Clean Line sold the Oklahoma assets of its proposed Plains & Eastern transmission line to NextEra Energy, and the assets of its Western Spirit project, located in New Mexico, to Pattern Development. A fourth project that had been in Clean Line’s portfolio was recently removed from the company’s website and tabled by the company. The Rock Island Clean Line was proposed to move wind energy 500 miles from northwest Iowa to Illinois and the PJM grid but saw repeated legal and regulatory setbacks. Detweiler declined to say why the company is selling Grain Belt Express or what the project’s assets consist of, though he said he and the company’s other founders intended to build and construct projects with the option to sell them. The project has yet to clear major regulatory hurdles in Illinois and Missouri, though Kansas regulators have given permission for the project to proceed. “Maybe that’s worth something” to a buyer, said Jennifer Gatrel, spokeswoman for Block Grain Belt Express – Missouri, a group that has fought to stop the project. She said they would continue to oppose the project’s efforts to obtain a certificate of convenience and necessity from Missouri regulators. The Missouri Public Service Commission has three times rejected applications for the Grain Belt Express. The most recent time, in August 2017, four of five commissioners signed a statement saying they believed the project is in the public interest but that a court ruling regarding a different transmission project in Missouri prevented them from approving a permit. The Missouri Supreme Court ruled in July 2018 that regulators were wrong to deny the permit, however, and sent the case back to commissioners. A new series of public hearings are scheduled Dec. 18-19 in Jefferson City. In a document filed Monday with Missouri regulators, Detweiler indicated that the Grain Belt’s developer would be positioned to buy property along the proposed Illinois route, allowing it to pursue a certificate again in Illinois, after obtaining a certificate in Missouri. The company has also asked for a five-year extension on the certificate already granted in Kansas. Invenergy, headquartered in Chicago, has offices in a half-dozen locations around the world. According to the company website, it has developed 127 wind, solar, natural gas and storage projects with a total capacity of 20,400 megawatts. The company declined to comment beyond its news release. John Grotzinger, chief operating officer for a coalition of municipal utilities in Missouri that has contracted to buy power off the Grain Belt Express, said he thinks the sale will only bolster the project’s future.